Bats are the staple of the 80’s vampire horror film- a cloud of bats casting their shadow over the light of the night moon, setting the scene with the element of fear, which seems to be the emotion instilled into many homeowners across the UK when a group of these furry flying fiends approach, in some instances people develop chiroptophobia, the strong fear of bats. However it is often argued that bats have been unfairly assigned this label; stories of blood feeding, bedroom dwelling, hair assaulting creatures of the dark passed down from generations of Halloween novels are often completely unfounded, leading to misinformation of how bats should be treated, which begs the question; are bats truly domestic pests? Or a species to be protected wherever possible? One typical bat stereotype which is true, however, is that bats seek refuge in dark corners of a property, typically within an attic or a small gap between walls. 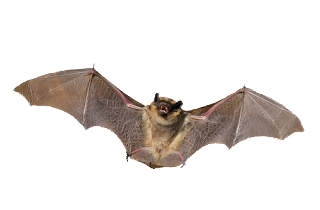 If left untreated for an extended period of time, bats can quickly damage structures by chewing through typical domestic building materials and creating additional entry holes. Additionally, bats can compromise the structure of buildings and small rooms as a result of their urine, which can degrade wooden flooring and home insulation. Those who have lived with bats inside their homes have quickly recognised the problem as a result of foul odours close to where the bats have claimed their nest, bat droppings create a pungent smell and can also cause respiratory disease in if encountered and left untreated. However, much to the delight of farmers across the nation, bats have recently been noted to perform ‘vital pest control’ on corn crops throughout the world. Researchers from the Southern Illinois University in the United States have carried out experiments which saw bats solely excluded from a 20x20m enclosure where corn-feeding insects could forage freely. The experiment saw bat activity in feeding on the herbivorous corn earworm larvae reduce their population by 41% in those areas, which has been estimated to save $1bn globally. When compared to a study in April 2011 by Science publication, loss in the bat species could cost agricultural sectors $3.7bn each year in North America alone. In conclusion, despite their poor and often misinformed reputation as a dangerous creature, bats have an important role to play within the world’s agricultural economy, saving the world billions of dollars each year by feeding on the larvae which can destroy crops. However, bats can still impact your health if you are in frequent contact with them. It is highly recommended a professional, with the correct equipment, deal with the problem as soon as the issue has been identified.